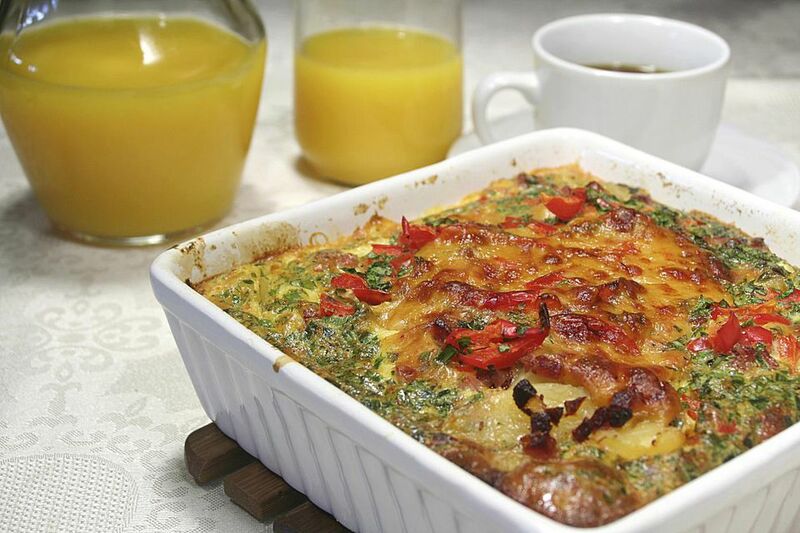 This breakfast casserole recipe features the major breakfast food groups—eggs, sausage, and potatoes. With some coffee and juice to wash it down, you're ready to take on anything. It's a great, easy, and inexpensive meal. Heat oven to 375. Spray, grease, or butter* a 5 or 6-inch diameter casserole dish. Shape sausage into a patty** slightly larger than the pan (it will shrink). Brown patty in a skillet over medium-low heat, but slightly undercook -- about 5 minutes on one side and 2 minutes on the other side. Remove from skillet and drain on a paper towel. Add chopped onion and pepper to the same skillet the sausage was cooked in and sauté for about 3 minutes, scraping up browned bits as they loosen. Season thawed and dry hash browns in a small bowl with salt and pepper, and then firmly press into the bottom of the prepared pan. Position the sausage patty on top of the hash browns and then spread sautéed onions and peppers on top of the sausage. In a medium bowl, whisk together the eggs, milk or half-and-half, Worcestershire sauce, and salt, and pour into the dish. Bake in the center of the oven for 35 minutes until lightly browned on top and a knife inserted into the center comes out clean. Cool for 15 minutes before serving. *Note 1: Butter or bacon fat is best. **Note 2: I make a large, flat patty that will cover the entire hash brown layer because it makes a better presentation to have a clear sausage layer (and because I like the texture) but you can also crumble the sausage. ***Note 3: You can make this the day before through step 6. Just cover with plastic and refrigerate. Then, the next morning, whip the eggs, pour into the pan and cook.